CLEVELAND, Ohio – Ohio Department of Transportation snowplows had been spreading AquaSalina, a deicing solution, on the state’s roadways for years when an environmental group last year obtained an unreleased Ohio Department of Natural Resources report that found high levels of radioactivity in the product. A team of scientists from ODNR’s division of Oil and Gas Resources Management/Radiation Safety Section, and the Environmental Safety Section compiled the seven-page report. The team tested 14 samples of AquaSalina from six locations in Cuyahoga, Summit, Tuscarawas and Guernsey counties. All of the samples were found to contain elevated levels of radioactivity in excess of state limits on the discharge of radioactive materials. The average radioactivity in AquaSalina also exceeded the drinking water limits for Radium 226 and Radium 228 by a factor of 300. Human consumption of any amount of AquaSalina is highly discouraged, the report said. But the team also determined it was unlikely that radiation exposure from spreading AquaSalina on roadways exceeded human dosage limits. Members of the state legislature rejected the reports’ findings, introducing a law last year that would ease regulations on AquaSalina, treating it as a commodity rather than toxic waste derived from oil- and gas-drilling operations. The law would also prevent ODNR from imposing any additional requirements. Additionally, the bill would require testing of AquaSalina no more than four times per year and would not require ODNR to test the brine for radium or heavy metals. “Nobody has any intentions to hurt the environment or dirty up the water and the air,” said State Senator Matt Dolan of Chagrin Falls, who sponsored the bill in the senate. “This company discovered how to take raw brine and convert it to a product that can be used safely on our roads and driveways with less corrosion than salt,” Dolan said. After the release of the ODNR report, however, one of the bill’s original co-sponsors, former State Senator Mike Skindell, Democrat from Lakewood, retracted his sponsorship. Now a state representative, Skindell did not return several phone calls and emails seeking comment. State Rep. Fred Strahorn of Dayton, the House Minority Leader, issued a scathing response to the bill. Chronic exposure to radium or radon gas can result in increased cases of bone, liver, breast and lung cancer, according to testimony by the OEC. In December, the house approved the brine law by a vote of 55-33. The legislative session ended, however, before the senate could vote. Both bills, which are identical, are expected to be reintroduced in a few weeks, Dolan said. AquaSalina is being used to deice roads by the Ohio Department of Transportation in 10 of the state’s 12 districts, but not in large quantities, said department spokesman Matt Bruning. From Sept. 1, 2018, to Feb. 4, 2019, ODOT applied 621,336 gallons of AquaSalina, or about 7 percent of the 8.8 million gallons of deicers applied during that five-month period. Last winter, ODOT used 1 million gallons of AquaSalina , a fraction of the 10 million gallons of deicers used, Bruning said. ODOT primarily applies rock salt and its own brine solution, derived from salt mixed with water, Bruning said. The agency decided to use AquaSalina in sub-zero temperatures after receiving the reports from ODNR and the Ohio Department of Health, each of which found radium in AquaSalina, but determined it was unlikely that exposure to the radioactive solution would exceed state standards. ODOT also considered the approval of AquaSalina by the Pacific Northwest Snowfighters, an association dedicated to ensuring the safety of deicing products through testing and evaluation, Bruning said. Since 2004, AquaSalina has been produced by a Brecksville-based company, Nature’s Own Source, which developed a process for recycling “400 million-year-old ancient sea water” into a deicing agent capable of clearing roads and parking lots at temperatures as low as -15 degrees. AquaSalina is derived from reprocessed brine obtained from conventional vertical oil and gas wells, not horizontal shale wells, which produce a fracking brine that is prohibited by law from being spread on roadways. Fracking brine can contain toxic substances such as kerosene, benzene and hydrochloric acid. At conventional wells, equipment operators capture the rising natural gas vapors in pipes and store the oil-brine water mixture in tanks, where the oil floats to the surface and the brine settles to the bottom. From there, the brine is drained from the tank and disposed of through underground injection wells or trucked to AquaSalina’s production facilities in Cleveland or Mogadore. The product is filtered to remove volatile organic compounds and trace minerals. One of ODNR test findings, however, was that the radiation in AquaSalina was higher than raw brine. It said Nature’s Own Source was producing Technologically Enhanced Naturally Occurring Radioactive Material, or TENORM. Mansbery said ODNR has put him at a competitive disadvantage, imposing “regulatory burdens” that require users who apply the solution to roads and parking lots to be state-certified brine haulers. “I’m just a small business owner who figured out how to take the dirty, oily raw brine water and process it to make a useful product rather than paying to have it dumped into an injection well,” Mansbery testified last year to the Ohio House. ODNR has remained on the sidelines during the legislative debate and did not testify last year prior to the vote. By moving forward with the brine bill, the legislature chose to reject both the 2017 ODNR report and the testimony of environmental groups, those opposed to the bill say. The OEC supports recycling brine water, but not at the expense of health and safety, Demeter said. 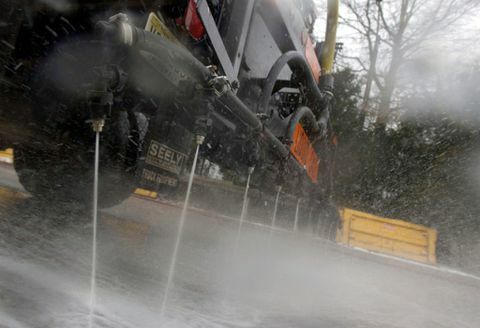 With sub-zero temperatures in recent weeks, ODOT road crews were using increasing amounts of AquaSalina deicers, spreading 621,000 gallons over the past five months.